AdditionalMetadata attribute is very useful to pass additional data to the view from model without using additional properties. Below example we can see how to use AdditionalMetadata attribute to pass additional data to view. In this default application we already have some features like login and register functions by default. So Im going to modify the registration page using AdditionalMetadata attribute. 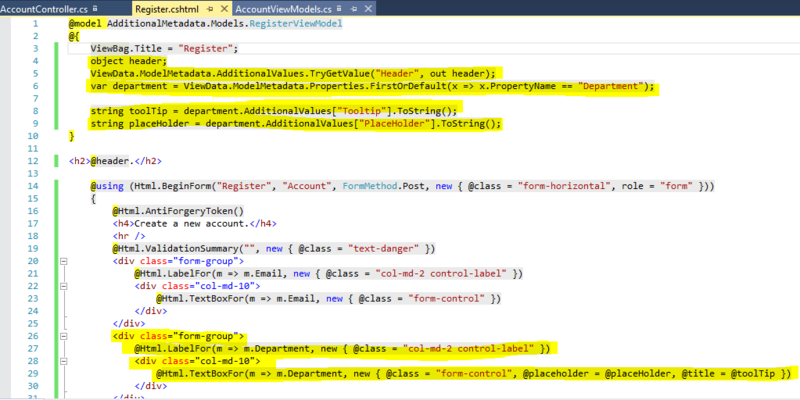 Go to Models -> AccountViewModels.cs file and find the RegisterViewModel class. Here we are going to add some additional data. So Im going to add few AdditionalMetadata attributes for Model and properties. 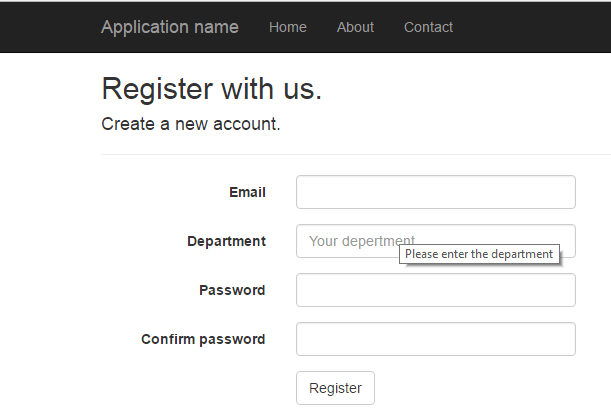 So when registering, user has to enter the department also. Add some AdditionalMetadata attributes to model and properties. Here I have added one AdditionalMetadata for the model and another two for Department property. “Header” for the page header text and other two are for department property. Now modify the View to include changes. Go to Views -> Account -> Register view and do the changes. We added a page header, tool tip and a watermark for Department field. For the tool tip we use “title” html attribute and for water mark we use “placeholder” html attribute. Set a debug point in the view and see the values. In the view we can see the values which we passed from the model applied in the page.